CNN has obtained this photo of Mahmood Alessa and Carlos Eduardo Almonte at a rally of an extreme Islamist group. Two New Jersey men arrested last week at John F. Kennedy International Airport allegedly on their way to fight with an al Qaeda affiliated group in Somalia were followers of an extreme Islamist group based in New York, CNN has learned. CNN has obtained an image of the two suspects, Mahmood Alessa and Carlos Eduardo Almonte, attending a protest in New York organized by the Islamic Thinkers Society on June 1 of this year. They appear to have been taking part in a demonstration against Israel. One is holding a banner; the other an Islamic Thinkers Society poster that includes the slogan, "Exterminate the Zionist Roaches." The Society's video of the event, posted on its YouTube channel, has since been removed. The rally took place just a week before the two suspects made their way to JFK airport and were arrested. "My soul cannot rest till I shed blood. I wanna like be the world's [best] known terrorist" Alessa is alleged to have told an undercover agent in the United States late last year. Later he said, "We'll start doing killing here, if I can't do it over there." Another image - from late in 2008 - shows Almonte at a different rally, holding a poster that says "Death to all Juice" (sic.) It's not clear whether that rally was organized by the Islamic Thinkers Society. Several calls to the Islamic Thinkers Society about Alessa's and Almonte's involvement with the group were not returned. On its website, the Islamic Thinkers Society says, "Our struggle is always intellectual & political non-violent means." But counterterrorism officials say that the group and another called Revolution Muslim have come under scrutiny for their anti-Western rhetoric and for endorsing the actions of al Qaeda and other terrorist groups. The two groups often hold joint events. While they have few full-time members and their rallies are sometimes sparsely attended, the Islamic Thinkers Society and Revolution Muslim have thousands of followers online, many of them American. According to counterterrorism officials they also organize private gatherings in the greater New York area. The director of intelligence analysis of the New York Police Department, Mitch Silber told CNN earlier this year: "In a sense they are almost bug lights for aspiring jihadists. They've got an anti-Western, anti-democratic, anti-U.S., pro-al Qaeda message." In April, Revolution Muslim posted a warning on its website that the creators of the cartoon South Park risked being killed for their depiction of the Prophet Mohammed in a bear suit. The warning was widely seen as a threat. Alessa and Almonte are by no means the first Americans alleged to have had links to the groups. CNN revealed in its recent documentary "American Al Qaeda" that Bryant Neal Vinas, a Catholic convert to Islam from Long Island, moved in Islamic Thinkers Society circles in New York before he left the United States. Vinas went to Pakistan determined to fight jihad against U.S. troops in Afghanistan. He subsequently confessed to helping al Qaeda plot a bomb attack on the Long Island Railroad. CNN revealed in the documentary that followers of the Islamic Thinkers Society not only helped radicalize Vinas, but also helped him connect with militants in Pakistan. Several other Americans recently charged in terrorism cases were followers of these groups. Counterterrorism officials say Colleen LaRose, a Pennsylvania woman also known as Jihad Jane, was an online follower of the Revolution Muslim YouTube Channel. LaRose was charged in March with plotting to assassinate a Swedish cartoonist; she has pleaded not guilty. Tarek Mehanna, a Boston resident, was charged last year with planning violent jihad in the United States - including planning to attack shopping malls. He had connections with members of Revolution Muslim, according to Yousef al Khattab, one of the group's founders. CNN cannot independently confirm those connections. Khattab has since left the United States, says he has quit Revolution Muslim, and is now living in Morocco. Mehanna has not entered a plea. Counterterrorism officials tell CNN that before he founded Revolution Muslim, Khattab was the chief ideologue of the Islamic Thinkers Society. In an interview with CNN's Drew Griffin last year, Khattab said he had met Vinas, the Long Island al Qaeda recruit, and made no secret of his radical views. "I love Osama bin Laden like I can't begin to tell you," Khattab said. The Islamic Thinkers Society and Revolution Muslim are offshoots of Al Muhajiroun, a pro-al Qaeda British extremist group that has seen several of its supporters convicted of terrorism offenses in the United Kingdom. 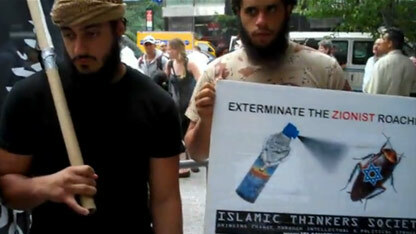 Like Revolution Muslim, the Islamic Thinkers Society is still active on New York streets. In April it held a protest rally outside the Israeli Consulate. After the rally, the group's spokesman, Abu Mujaddid, told CNN that the group plans to step up its activities in New York and was successfully recruiting supporters. The activities of both Revolution Muslim and the Islamic Thinkers Society are protected by First Amendment guarantees. "As much as the Islamic Thinkers Society might put out an extremist message, it seems they go right up to the line of the First Amendment. For the most part they, themselves as a group, aren't acting," NYPD's Silber told CNN recently. Terrorism experts believe that groups like the Islamic Thinkers Society are dangerous nonetheless. According to Marc Sageman, a former scholar in residence at the NYPD, "Even if they do not have the connections to help [young radicals] go further, they articulate the glory of fighting Jihad, the glory of doing something, of being active. And this very much inspires young people."